Sweden is European Champion of Optimistic Team Racing. The Swedish team after 207 matches was able to conquer the European title, leaving behind Turkey and Germany, thus winning the Cassa Rurale di Ledro trophy. All the young european sailors have proved to be very prepared, correct and polite, making all the races of very high technical level. The Italian team did not manage to defend the last year’s title, so Edoardo Bocale, Lorenzo Pezzilli (Circolo Vela Ravennate) Claudia Quaranta (Circolo Vela Bari) and Malika Bellomi (Fraglia Vela Riva), coached by Marcello Meringolo had to be satisfied with the fifth place. 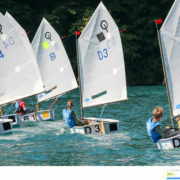 The organization of the Optimist European Team Racing Championships for the years 2018 and 2019 has been re-assigned to the Associazione Vela Lago di Ledro, thus confirming the high level of the regatta,s the skill of the organization and the collaboration of the entire community of Valle di Ledro.